The sound of Poland is the shimmering of trees on a windy day, the vibrant color of a ripened wheat field, clicks of struck cobblestones in an ancient town and, above all, the stunning movement of a folk dance. In partnership with the Polish Embassy in Bangkok we explore this and more in works by 19th and 20th-century composers including the incomparable Marian Sobula in the rarely heard but sparkling piano concerto by Paderewski-Poland’s greatest pianist and the nation’s first prime minister. The sound of Poland is the shimmering of trees on a windy day, the vibrant color of a ripened wheat field, clicks of struck coble stones in an ancient town and, above all, the stunning movement of a folk dance. 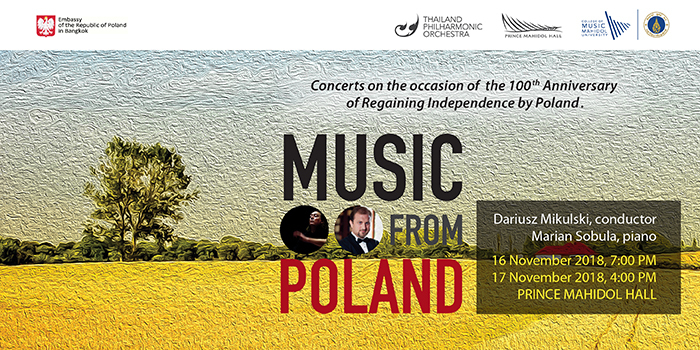 In partnership with the Polish Embassy in Bangkok we explore this and more in works by 19th and 20th century composers including the incomparable Marian Sobula in the rarely heard but sparkling piano concerto by Paderewski – Poland’s greatest pianist and the nation’s first prime minister. Described by the press as “one of the finest pianists of his generation”, Marian Sobula is paired for a performance of Paderewski’s masterwork with fellow Pole and long-standing guest maestro Dariusz Mikulski. Mikulski’s intimate knowledge of Polish repertoire should prove fruitful in works by Lutoslawski and Kilar. The award-winning soundtrack composer for Francis Ford Coppola’s classic film “Dracula”, Kilar’s concert works are equally engaging and colorful. “Music from Poland” is an opportunity for expanding cultural knowledge of a uniquely musical European nation. 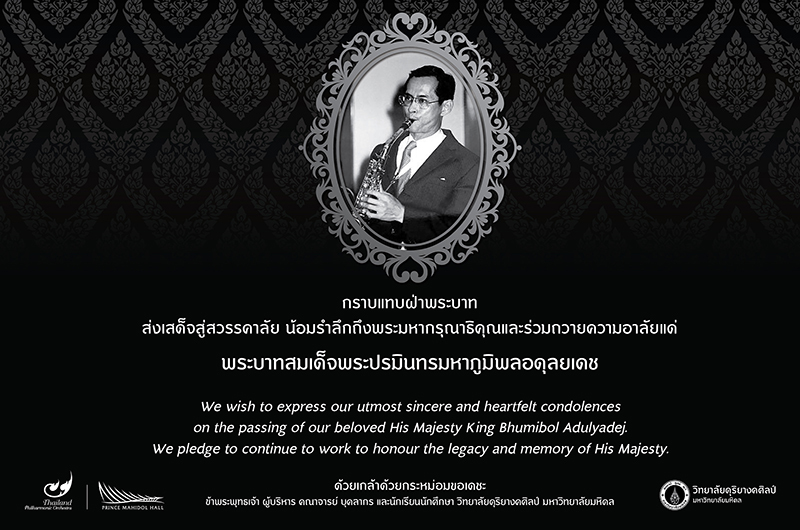 The concerts take place on November 16 at 7PM and November 17 at 4PM in Prince Mahidol Hall.